On Tuesday night, the Australian Government released its 2016-17 development assistance budget. IWDA welcomes the Government’s continuing commitment to gender equality and women’s empowerment, and recognition of ‘their importance to Australia’s national interest’. These positives are overshadowed by unprecedented aid cuts. This year’s cut of $224 million or 7.5% after inflation is the fourth cut in a row, amounting to a total reduction of some 30% after inflation over the last four budgets. Aid spending is now at its lowest ever level as a proportion of both total Government expenditure (0.8%) and Australia’s gross national income (0.23%). We are now well below the global average of just over 0.3% of GNI. Once there was a commitment to bring aid up to 0.5%. We’re at less than half that now. These cuts have affected all parts of Australia’s aid program, including expenditure on gender equality. The scale of cuts to the aid program have not been borne by other areas of Commonwealth expenditure. The Government has effectively improved its budget bottom line at the expense of developing countries. Other countries facing fiscal pressure are not reducing their aid budget. All other OECD donors except Australia and Portugal have continued to increase overall aid spending. They recognise that pressing development priorities persist, including responding to growing humanitarian needs, addressing violence against women, disaster preparedness and response, and infectious disease concerns. They recognise that development cooperation benefits both aid giving and aid receiving countries. This overall story of unprecedented cuts shapes every aspect of this year’s aid budget. While the analysis below tells us about relative priorities, the big story is that for the Coalition Government, aid is a very low priority, and a much lower priority than most Australians think it should be. Where is this year’s aid budget focused? Australia’s aid remains firmly focused on the Indo-Pacific region, with more than 90% of the aid budget spent in our immediate neighbourhood. The big cuts to country programs came last year, when almost $1 billion was cut from the aid program. Aid allocations to specific countries are mostly exactly the same in dollar terms as last year, meaning a small real cut after inflation. The table below shows Commonwealth Government funding over the last three years to the countries where IWDA has program partnerships, plus regional programs, which include initiatives such as the Pacific Women Shaping Development program. 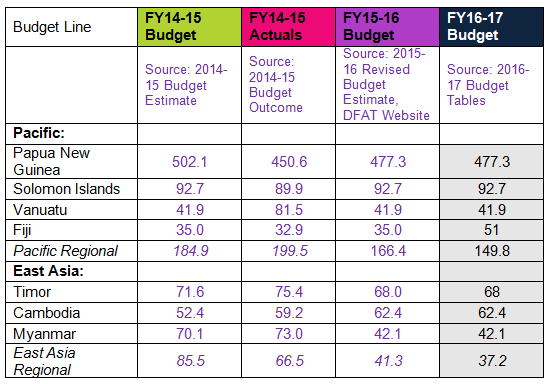 We can’t currently track with accuracy how much is spent on gender equality initiatives within these programs. This is a problem, as we explore further below. Multilateral and regional programs have borne the brunt of this year’s cuts. The Department of Foreign Affairs and Trade (DFAT) says this is a delay to payments which will be accommodated by the return of indexing for inflation in next year’s budget. This will continue to squeeze other aid spending, including country programs. In terms of sectors, spending on health and education has continued to fall, health by around 16%, education by 9%. Health expenditure is now at 13% of the overall aid budget, one of the lowest proportions in the OECD. Governance remains the biggest sector overall. Spending on innovation and agriculture has been protected, reflecting the Government’s private sector and aid for trade priorities. This is despite the fact that these are among the worst sectors in terms of aid performance, indicating the limits of the Government’s Making Performance Count policy. There is a new humanitarian initiative for Syria and the region, and increased prominence to climate change, but the “resilience” sector, which includes humanitarian and environment spending, continues to fall. The Australian Aid Budget Summary 2016-17 confirms that ‘Gender equality is critical to development and stability, and will remain a central pillar of the aid program.’ The dedicated Gender Equality Fund is up 10% in nominal terms, to $55 million. In the context of significant overall cuts to the aid program, this is significant and welcome. The aid budget continues to support Pacific Women Shaping Pacific Development, a vital 10 year (2012-2022) $320 million program working to improve political, social and economic opportunities for women. Also supported is the new Investing in Women Initiative, a $46 million program to support partnerships with government and the private sector in South East Asia to expand women’s economic participation; and continuation of the Empowering Indonesian Women for Poverty Reduction program. There is funding for specific programs to address violence against women in Afghanistan, Pakistan, Cambodia, Timor-Leste, Papua New Guinea and across the Pacific. IWDA also acknowledges and values the internal focus on strengthening performance on gender equality across DFAT, including through technical advice, training and performance frameworks. Good leadership and an able team within DFAT is having an impact. BUT– and it is a big but –expenditure on gender equality lags well behind policy commitments, and is not in line with the scale and significance of gender inequality and violence against women, especially in our region. For example, the Papua New Guinea program is spending $12 million to tackle violence against women or 0.025% of the total PNG aid program of $477.3 million. Violence against women is one of the most significant security issues in Papua New Guinea. It is a priority for the Australian Government. But the numbers demonstrate very clearly that spending priorities do not reflect policy commitments. The Government will find it impossible to realise its policy objectives without fixing this disconnect. Part of the problem is that DFAT is working with one hand tied behind its back in terms of tracking expenditure on gender equality. Its systems are better at tracking spending when gender equality is the principal objective of the program. When gender equality is a significant objective – which is how most of Australia’s aid spending on gender equality is categorised ‑ it is impossible to say how much is actually spent on promoting gender equality and addressing barriers to women’s economic empowerment. We only know the total value of initiatives with gender equality as an important but secondary objective. Given that by definition, gender equality is not the main focus, using total project value as an indication of expenditure on gender equality is misleading at best. 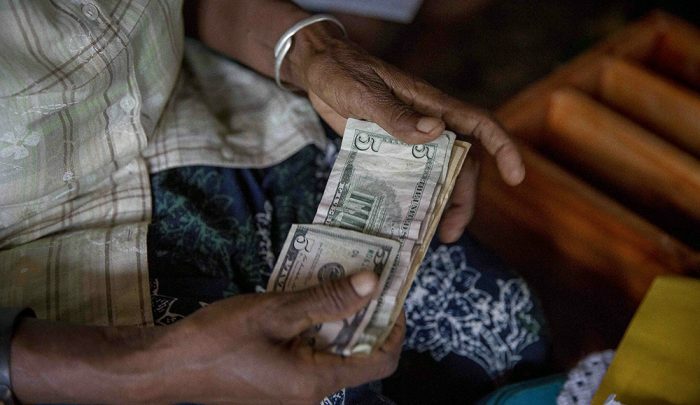 Improving the ability to track and report how much is spent, on what, to promote gender equality across the aid program is crucial to assessing effective use of resources – and to more closely linking policy priorities and spending. 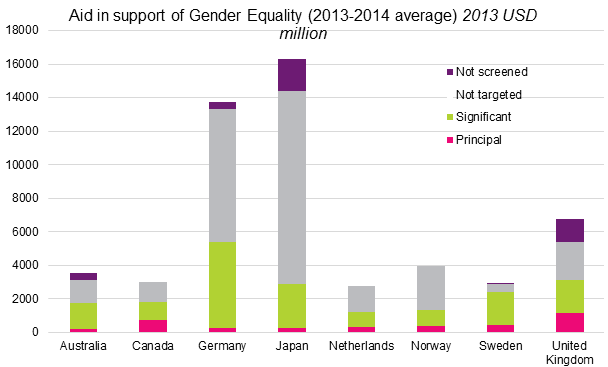 IWDA also continues to urge the Australian Government to increase the proportion of aid targeting gender equality as a primary objective (shaded pink in the graph below), which is behind many of its counterparts. Another big story in this Budget is the contrast between the huge reduction of investment in human security through the aid program in recent years and the huge increase in investment in defence capacity to address security challenges. This reflects a narrow and incoherent approach to national security, and one which is at odds with Government’s policy leadership on UN Security Council Resolution 1325 on Women, Peace and Security. This was a priority during Australia’s recent two-year term on the Security Council, and its importance is recognised in the recent 2016 Defence White Paper. Aid spending is 0.8% of the national Budget and flat lining out to 2020. Defence spending is currently around 8% and projected to reach 9.4% of total Government spending by 2025. Australia’s entire aid program costs roughly as much as one new submarine. The Government is funding 12 of these, but can’t find adequate funding for the security of women and children experiencing violence, in our region or at home in Australia. How is Australia’s overall budget progressing gender equality? Sadly, the Australian Government no longer undertakes a gender analysis of the annual Budget. In the 1990s, Australia led the world in producing a formal budget document examining the impact of the budget on women, with the then Office of the Status of Women reviewing proposed savings and spending measures for their impact on women. This year, as in recent years, civil society organisations and academics are working together to prepare their own gender analysis of the Budget, which will be available next week. As in recent years, IWDA will contribute the section on the aid budget. Budgets tell us about priorities. Despite the Government’s positive language on gender equality and women’s empowerment, the numbers tell us that it is not a priority. This is short-sighted and undermines Australia’s national interests and our ability to meet commitments under the new Global Goals for Sustainable Development.